The 2019 incarnation of the world's most popular Film Noir festival, Noir City, is returning to the legendary Egyptian theater February 15 through 21 for a week-long indulgence of danger, desire, and despair. The festival presents 20 classic films covering the years 1949 to 1959, as they were experienced on their original releases, pairing a top-tier studio "A" with a shorter, low-budget second feature, or "B" film. Many of the films will be presented in glorious 35mm. Czar of Noir and host of TCM's "Noir Alley," Eddie Muller, will host the week-long Festival to delight patrons with intrigue and sordid anecdotes from Hollywood. Opening Night will begin with the Casey MacGill Trio setting the mood with fifties noir favorites, cider tasting courtesy of Capitol Cider, and a shadowy cityscape photo booth to capture gangsters, molls, vixens, and villains at their sinister best. The week starts off big with the newly completed 35mm restoration of Trapped (1949), Richard Fleischer's hard-edged noir classic starring Lloyd Bridges, courtesy of the Film Noir Foundation and UCLA Film & Television Archive, followed by Robert Siodmak's The File on Thelma Jordon (1950), featuring Barbara Stanwyck, in a terrific two-faced turn in one of her rarely screened films. The "A"s include The Turning Point (1952), starring Edmond O'Brien and William Holden, in a ripped-from-the-headlines thriller about organized crime and corruption in a small town, and leaping on the voyeurism bandwagon of 1954 powerhouses Rear Window and Witness to Murder, is Pushover (1954) starring Fred MacMurray and femme fatale Kim Novak (in her film debut). The "A"s wouldn't be complete without that quintessential 1950s staple of noir, Orson Welles' Touch of Evil (1958), about a California border town where kidnapping, extortion, and murder are business as usual. Our "B"s include Killer's Kiss (1955), Stanley Kubrick's inventive and kinetic tribute to Manhattan and film noir, Murder by Contract (1958) a Martin Scorsese favorite about a hitman who has a crisis of conscience and Odds Against Tomorrow (1959), a gritty, tense, racially charged heist film starring Harry Belafonte and Robert Ryan. In addition to films, trivia, and nightly prizes, we are partnering with KNKX to present the Dmitri Methany Group on Saturday night, playing 1950s movie themes and crime jazz; and Saturday through Monday, Chef Joshua Henderson of Huxley Wallace Collective, will host a pop up concession stand, providing guests a menu of updated movie-goer favorites. 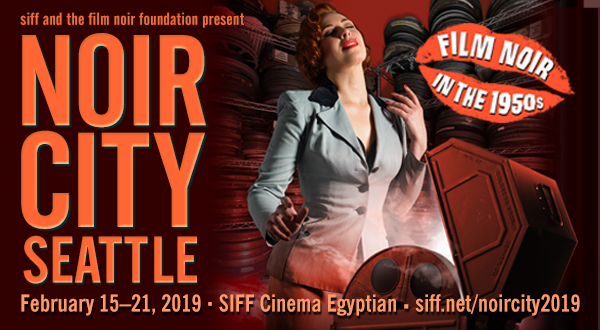 Stan Shields, Festival Programming Manager, says, "We are excited to bring Noir City back to SIFF Cinema Egyptian again this year.The 1950s were a fascinating period in Film Noir, and there is no better venue to experience this powerful era of cinematic history." SIFF Artistic Director Beth Barrett puts it all in perspective, "For the last 11 years, SIFF and the Film Noir Foundation have been partnering to support the restoration of noir films, and bringing this artistically and culturally important genre to the SIFF audiences," adding, "and no one is better at connecting noir to modern audiences than Eddie Muller." Passes for Noir City 2019 are on sale at www.siff.net/noircity2019. Full schedule and individual tickets are available now. The Film Noir Foundation is a non-profit public benefit corporation created as an educational resource regarding the cultural, historical, and artistic significance of film noir as an original American cinematic movement. As a focal point of the classic film noir revival, the Foundation serves as a conduit between film companies and repertory cinemas still eager to screen these films in 35mm. Revenues generated by ticket sales encourage studios film archives to strike new prints of films that are at risk of disappearing from public view, either through neglect or scarcity. Once these films are unearthed and returned to circulation, the chances exponentially increase that they will be reissued on DVD, available in pristine, affordable form for future generations of film-lovers. Founded in 1976, SIFF creates experiences that bring people together to discover extraordinary films from around the world with the Seattle International Film Festival, SIFF Cinema, and SIFF Education. Recognized as one of the top film festivals in North America, the Seattle International Film Festival is the largest, most highly attended film festival in the United States, reaching more than 140,000 annually. The 25-day festival is renowned for its wide-ranging and eclectic programming, presenting over 400 features, short films, and documentaries from over 80 countries each year. The 45th annual Seattle International Film Festival will be held May 16 through June 9, 2019. SIFF Cinema exhibits premier theatrical engagements, repertory, classic, and revival film showings 365 days a year on five screens at the SIFF Cinema Uptown, SIFF Cinema Egyptian, and SIFF Film Center, reaching more than 175,000 attendees annually. SIFF Education offers educational programs for all audiences serving more than 10,000 students and youth in the community with free programs each year.